We explored the science and history of the variable pitch propeller back in November. This month, we’re looking at the science behind the fixed-pitch propeller. So, how does the fixed-pitch propeller work, and who still uses them? To understand what a fixed-pitch propeller is, you first need to understand how pitch works. The pitch of a propeller describes how the blade is angled to cut into the air. Put another way, it’s how much the propeller is twisted relative to the path it’s traveling in. Blades are subject to the same aerodynamic laws as wings, and the propeller has added rotational velocity that must be added to its forward velocity, making the flight path of propeller blades into a spiral. Changing how the blade cuts into the air and pulls air toward it changes the operational speed and power of the aircraft. Achieving optimum power, speed and efficiency in aircraft requires a different propeller pitch on takeoff, climb, and as one cruises at alternating speeds. Variable pitch propellers change their pitch automatically based on air speed. However, fixed-pitch propellers have their pitch set at installation, and it can’t be changed while the aircraft is in flight. Fixed-pitched propellers, then, have to compromise in their efficiency and power by setting an optimum pitch before takeoff that will need to power the aircraft through takeoff, climb and cruising. 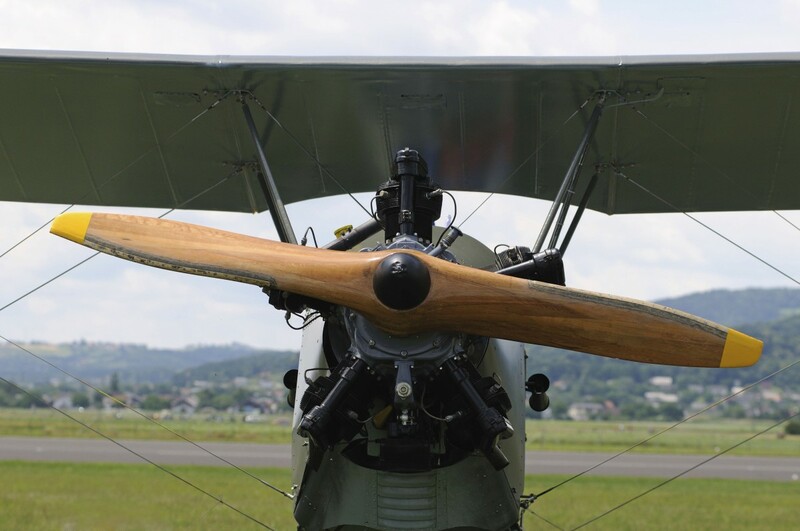 Fixed-pitched wooden propellers were the norm on aircraft prior to World War II, and they remain particularly popular on vintage aircraft.